Thief is getting a "companion app" for iOS and Android devices that will track in-game stats, link to the official wiki and interactive maps, offer access to exclusive merchandise and more. 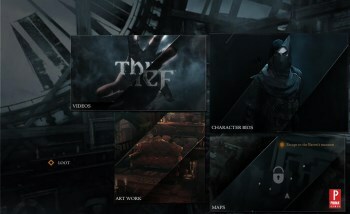 Eidos Montreal revealed plans today for an iOS and Android app for the upcoming Thief that will "enable fans to gain additional insight into the Thief universe and offer a second-screen experience to fully engage with the game upon release." The app will initially launch later this month in a "lite" version providing access to news, trailers, artwork, exclusive screens, character bios and other information, while the full version will come out alongside Thief and sell for $2.99. For three bucks, you get live access to in-game stats, the official Thief Wiki, interactive maps and exclusive art and background content. The app also includes the first two issues of the official Thief digital comic created by Dark Horse and links to official Thief merchandise, should an irresistible urge to purchase a nu-Garrett hoodie strike you during your morning commute. Those with the foresight and good manners to preorder Thief from GameStop won't have to lay down three bones for the app, however, as it will be provided free as part of the preorder bonus package that also includes the "Bank Heist" mission, which will sell separately post-release for $4.99 - read more about that here - and the official soundtrack, performed by the Prague philharmonic orchestra, that will be available stand-alone for $9.99. Thief comes out on February 25 for the Xbox 360, Xbox One, PlayStation 3, PlayStation 4 and PC.